God called. Well, not exactly GOD. This other dude. 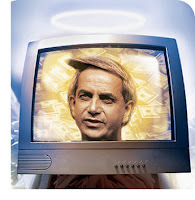 Benny Hinn. Called my cell. He did! Caller ID showed "Unknown Number" but the ANI came across and it was an 800 number! 800-725-6570. Benny said he wanted me to know about an a "training conference" for his "ministry." Said it is coming to Birmingham, AL, in September. Then he hung up. Couple of thoughts blipped through my mind after I heard that click: What church is so desperate that it wants to train ME to handle its people? Have I ever had a dive phone call before? And how did Benny get my cell phone number?? ?